As many of you know, the national conference for Romance Writers of America just wrapped up yesterday in San Antonio, Texas. I was lucky enough to be there, and today I am reveling in my memories and recovering from several days of not-enough sleep and a few too many delicious Texas margaritas! These first two photos were taken at the Alamo, which was a short walk from the conference hotel. I loved the grounds even more than the interesting museum. Just beautiful! 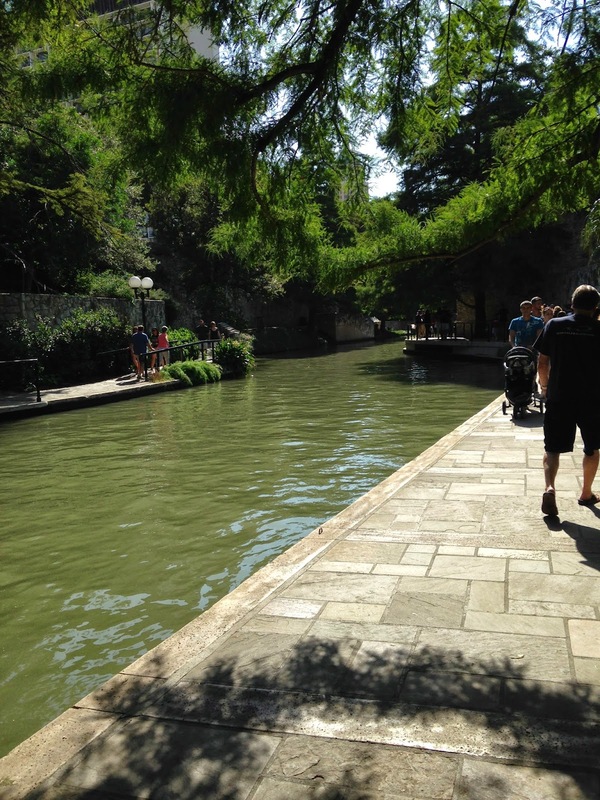 The conference hotels were right along the River Walk, a lovely path that follows the San Antonio River as it travels through downtown. It was extremely hot out during the day, but dining or strolling along the walkway in the evening was a real treat. What fun it was to talk with fellow authors, make new friends and reconnect with people I met at the conference last year. I also got to spend some quality time with members of my local RWA chapter and celebrate their conference successes with them. I participated in the annual "Readers for Life" literacy signing, in which hundreds of authors signed copies of their books to raise over fifty thousand dollars for charities that promote literacy. Here I am - it was my very first book signing ever! I attended informative workshops on creating emotion in stories, using more vibrant, animated language in my writing, and marketing my books. But I think my favorite event was the Superromance Open House, where aspiring authors came to learn more about the series. I am so newly published - just one book away from where they are - and it was nice to be in a position where I could encourage them to reach for their dreams, just as others encouraged me. I'm starting my week filled with gratitude and good memories, and looking forward to the RWA National Conference next summer in New York City. And if you're thinking of attending too, please let me know. Maybe those of us who write and read the SuperAuthors blog could meet up for a drink. It may take me a year to recover from too many Texas margaritas, but I'm sure by next summer I'll be ready to indulge in a few Manhattans! Claire, what great pictures! Hope your first signing was a blast. Sounds like you had a VERY successful conference! Thank you, Kris! It was wonderful. I wish you'd been there. Did you hear that your book cover was projected on the wall during the Harlequin Party? It would have been fabulous, I have no doubt!! Oh your pictures are lovely. I wish I could have been in San Antonio. I know I will never write a book but I'd love to meet the people who write the books i love to read. Kaelee, I am the same way. I go to conferences part writer and part Biggest Fan! It's amazing to meet, or even catch sight of, the people whose books I've loved for so long! Claire, I heard that! But - which book? Nobody has said! Kris, it was Dating a Single Dad. I'll e mail you a photo!